Hermit Dubz: The elusive dub hermit, often unseen, toiling away in his hermit cave, meditating on low frequency vibrations. This secretive character grew up travelling the world. From an early age, the love of reggae and dub was instilled in him, and would remain his deepest love. Moving to England in the 90s as a teenager, he discovered the newly awakening electronic dance music scene and was soon DJing and creating his own sonic experiments. 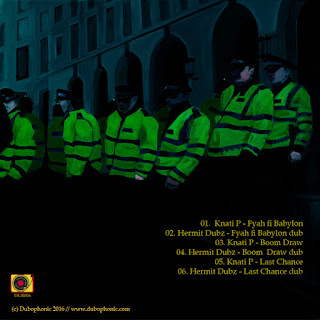 Over the years, the reclusive Hermit Dubz has been accumulating a horde of dub influenced sonic artefacts, and more recently building the Hermit Cave studios in Birmingham, Uk. After a long period of experimentation, isolation, meditation and contemplation, Hermit Dubz has re-emerged, ready to unleash his sonic relics. Knati P: Musician, painter (the artwork for this release is a painting by Knati), and entertaining performer with a unique vocal style. He studied at the Jamaica School of Art, moved to Brixton, London, in the late 1980s and regularly took part in the Notting Hill festival. In the year 2000 he was voted MC of the year. He has an impressive recording/performing record (Pineapple Tribe, Jah Observer, R.D.K, Manasseh, Equalizer, Skanga International Muzik etc.) and is a much respected lyricist, vocalist and MC. The two artists met in Surrey, UK, at a dance where Knati was performing with his local sound system, Da Vinci. They have been friends and musical collaborators ever since, and the result is some great riddims, which remained hidden in the Hermit’s cave for quite some time. 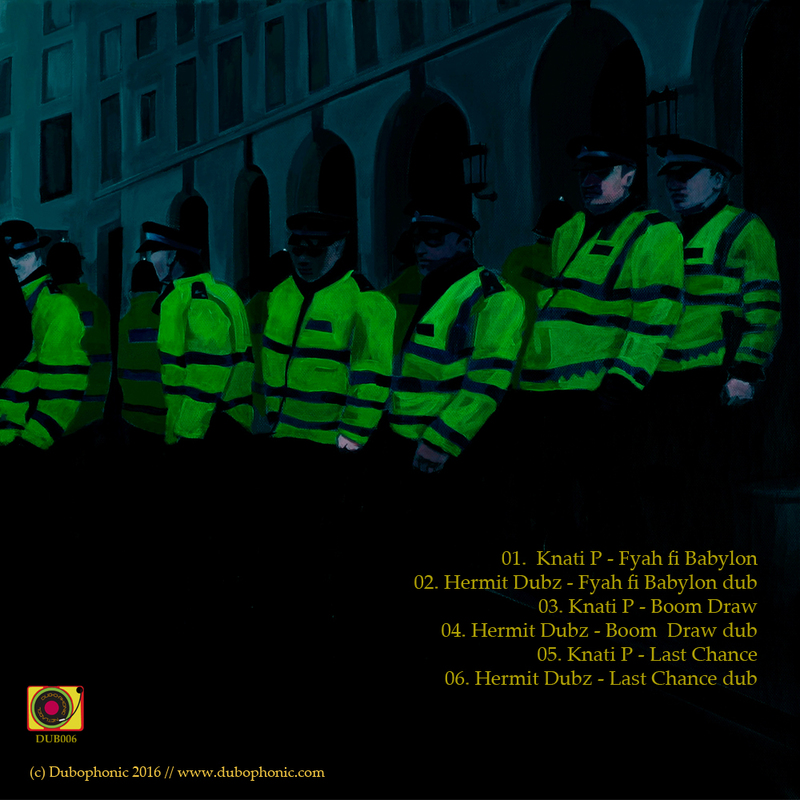 We managed to get hold of some those tracks and we present them to you today in the form of an EP. 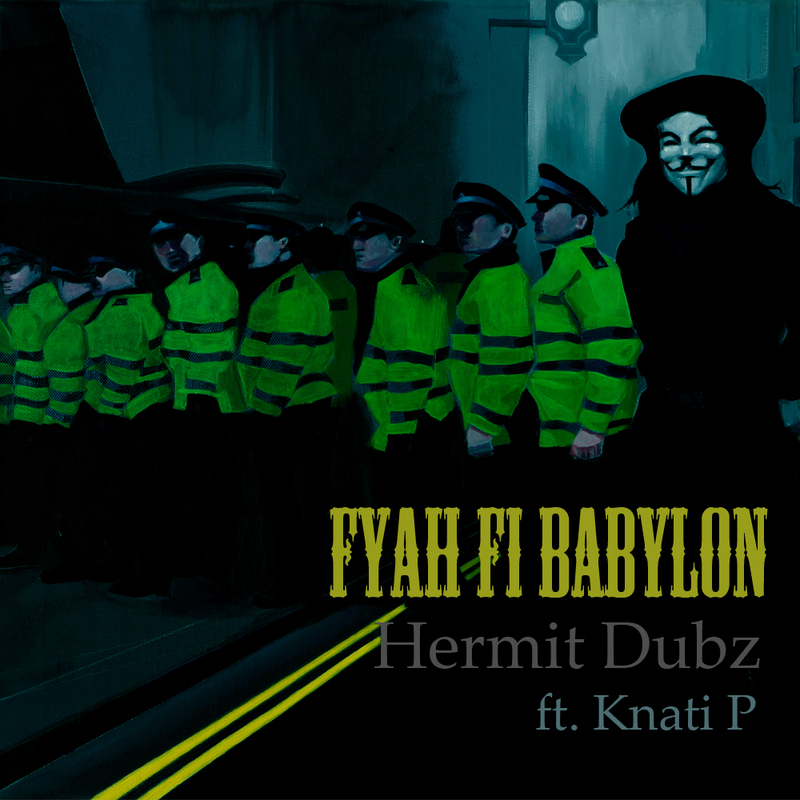 "Fyah fi Babylon” consists of 3 vocal tracks and 3 blazing dubs. We hope that the bass heavy sound of Hermit Dubz and the original Jamaican voice of Knati P will be the perfect combination for your upliftment.